Failed to verify the server certificate. This could be because of your network configuration or your proxy settings. You may also see experience this problem when you want to send or receive mails, because Mail app on your Mac may not connect to your email account. Even though this error message says this could be because of network or proxy setting issues, users have stated that they are experiencing this problem when in fact there’s no network connection or proxy issues. 1-Try temporarily disabling your antivirus software. It is known that sometimes antivirus software may cause this problem. If this solutions does not solve your issue, read on. a-Launch Keychain Access (Applications > Utilities). c-Now, find expired / revoked certificates, if any. Expired / revoked certificates will have a red X sign. 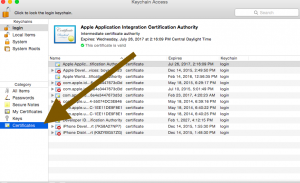 Find also certificates with a red X mark saying “This certificate was signed by an untrusted issuer” or “This certificate was signed by an unknown authority”. When you find them, delete them. d-When you are done, restart the Mail app. Did you disable your antivirus software? I have the Avast suite, and it was necessary for me to disable the web shield, the mail shield and the system shield in order to successfully add my Google account to my Macbook Pro. Good luck! Thank you! This was the problem! Hi Also worked for me once I turned off Avast. Were you able to switch it back on again afterwards? or do i need to find another anti virus suite? Same! I just diabled the mail server and it worked perfectly. thanks! Disabling my Kaspersky antivirus allowed me to add my gmail account. So many thanks for the suggestion…. Just delete the Login Certificates using the Keychain Accesses. I phoned Apple and they told me to rest the NVRAM but that made no difference. Finally found this feed and I disabled Avaast and all was well and I could add it. Thank you! I had to turn off Avast to connect my Google/S Planner calendar to iCal. Thanks for the info. When I tried to disable Avast it wouldn’t recognize my password. Then when I tried to get a new password, it would not recognize my gmail or regular email. It said it was not in the system. Therefore, I can’t disable my Avast account. Any ideas what to do? I don’t have anti virus software on my mac to disable. What else could help me set up Yahoo email? Disabling the antivirus software temporarily on my MacBook Pro solved this problem immediately. Thank you !! Hi all. In my case the ‘anti virus’ software was Adguard, an add blocker. So please be aware that it’s not necessarily an anti virus application that’s causing this. After switching Adguard off adding a Google account was a piece of cake. Funny thing is that deleting all certificates on my iMac and rebooting afterwards helped me. But on my MBP, that didn’t work. But disabling adguard helped, so thanks for that. Funny thing is that I have adguard on my iMac as well. Adguard was the problem! Thank you so much! AH, THANKS! I have adguard as well and was trying everything else mentioned here but to no avail. Adguard did the trick. Once disabled, it worked like a charm. Thanks! Thank you very much. ADGUARD was the cause of my issue as well. I turned it off and was able to add my Google account. Literally nothing here or on any page I’ve seen fixes my issue. I have the same issue as the OP, but I have no antivirus and no expired certs. Thank you so much for this advice. It worked for me after trying absolutely everything else. My sanity has been restored! OMG!!!! I did everything listed above, and I still continue to get the same message. I was scared of deleting the expired certificates, but did it anyway, and now, nothing worked, and I’m still in the same boat. I’m getting the same message for Yahoo, and for google mail. I don’t even have any anti-virus to turn off! What else can I do to get the mail to work? It works perfectly on my phone, but no on my macbook!! THANK YOU VERY MUCH! I have Avast and that was the problem. Thank You so much! After all the post this one did the job! Great tech advise I will follow this source moving forward! Yes, disable Avast. Thank you. Thank you!!!!!! I’ve had Genius phone calls and read every kind of voo-doo resolution on the internet–none were useful. I followed this group’s advice and resolved the problem in about five minutes!!!! Ok, for those who the above suggestions didn’t work, the next question is do you have Qustodio installed on your Mac? If so, it will need to be temporarily disabled to allow the account to be added. Note that Qustodio also stuffs up 1Password v6 in regards to working with browser extensions. While Qustodio has a help section describing things that stop it from working, it would be nice if they add information on things Qustodio stuffs up! Thank you Andrew!! This was my issue – I temporarily disabled Qustodio and was able to add my Google account! The solution for me was the Qustudio parental control App!!!! I’m new to macboook and just want to setup email, nothing installed. Fixed it for all the mac users with no anti virus. the clock was set to the wrong time. I had to open the preferences and deselect set time automatically and then reselect. Then all is good! none of this worked for me,I don’t have virus software, I have never had this trouble adding a gmail, just added a different one two weeks ago, I was deleting this account to figure something else out, but now I can’t get it back on. I donate have adguard, or avast or Qustudio, I have no certificates, and I’ve looked for adblockers. Its a Mac 10.13.5 (yes I need to update my software probably.. but seriously WTF? MacBook Pro out of the box and have installed NOTHING. Won’t allow a gmail account to be added to Mail. I guess I will install the Apple updates I just got notified about. I’m not feeling good about it. hey there everyone. I really hope someone can help because I’ve been going crazy over this same issue. I just got my MacBook Pro and I’ve gone through the initial setup and now trying to log into my Google accounts, through Internet Accounts, but I’m getting the same message. I have nothing on this computer. No Ad blockers, no anti virus, nothing. Can someone help?? I recently tried to add an additional Google account to my Mac using the System Preference pane. However, I encountered the error Connection Insecure – Failed to verify the server certificate. This could be because of your network configuration or your proxy settings. This was on a newly configured MacBook Pro with macOS Mojave 10.14.1 that I had logged in with my Apple ID, which had been used previously so obviously was bringing along with it certificates from my previous systems via the iCloud Keychain. For me the fix was in the macOS keychain. Close System Preferences. Open Keychain Access (using macOS Spotlight search) and in the upper left, select “login” keychain, in the lower left, select “Certificates” and I had 2 (two) certificates listed “COMODO Client Authentication and Secure Email CA” and “UTN-USERFirst-Client Authentication and Email” I copied these out to my desktop (as a precaution) and then deleted these two certificates from the Keychain. 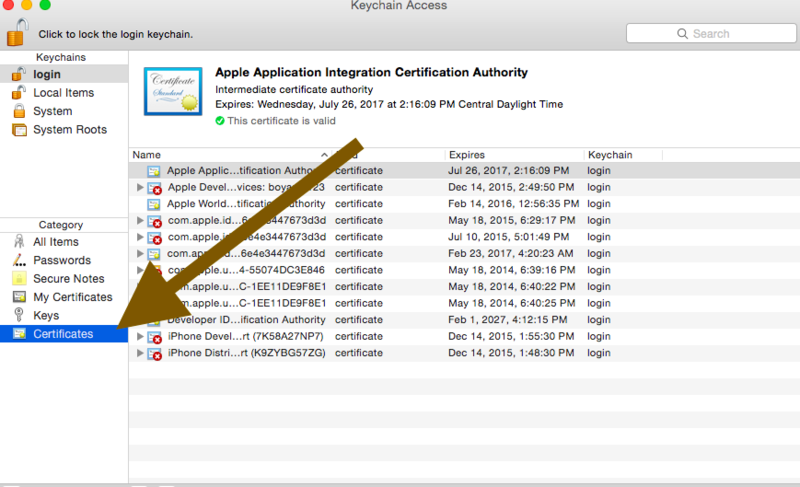 I closed Keychain Access app and re-opened System Preferences. I can now add Google and Yahoo email accounts again from “Internet Accounts” preference pane. AAAAAAAAAAAAAAAAAAAAAAAH It literally doesn’t work at all. I’ve done everything in the comments and the article, and I still can’t add a google account.